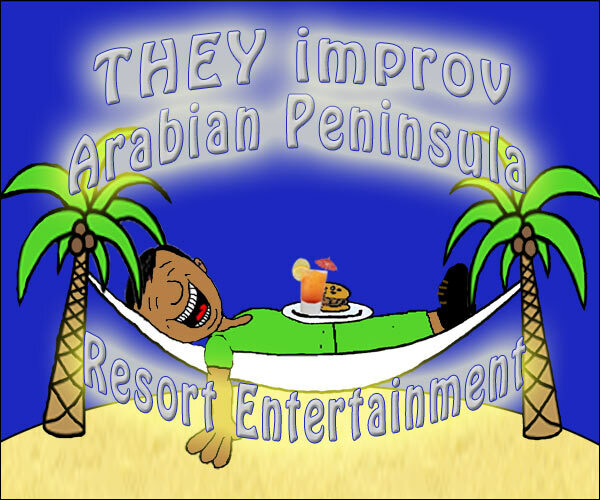 THEY improv provides Arabian Peninsula resort entertainment programs that can be brought to any of the luxury hotels in the region. THEY provide a variety of options to entertain a wide array of audiences in multiple ways. With sketch and improv comedy, game shows and murder mystery dinners for entertainment, scavenger hunts and mini-Olympiads for activities, crafts, games and comedy class programs to entertain kids and families alike, and hospitality training programs for staff, the real advantage to hiring THEY improv is the ability to multi-task and prove more useful than hiring separate groups for individual elements. If you operate or manage the hiring for an all-inclusive or other resort or hotel in the Arabian Peninsula, contact THEY improv about our programs and our ability to rotate casts to keep personnel fresh and reducing actual turnover since you are working with our company rather than the individuals. As Americans, we have a unique understanding of your guests' needs and can help the rest of your staff meet those needs. THEY improv is a professional company with cast members all over the world. The quality and programs we operate are fairly uniform and are built for our American clients. Thus, for Arabian Peninsula resorts looking to better cater to American clients, we can plug in a variety of cast members to any needs that your resort or hotel may require. Dealing with one company that can freely swap cast members based on training and availability gives you the flexibility that is rare in our industry. Arabian Peninsula Resorts generally have more land and activities that their hotel counterparts, though there is a lot of blurring the lines between them. We offer much of the same to both types of properties, though resorts tend to be more likely to try to add amenities to their guests and have more of a desire to keep guests on property. Our activities and entertainment programs can help keep guests entertained on location and thus keep the business in-house, as it were. Once you contact our director we'll discuss your needs and come up with a custom designed package for your Arabian Peninsula resort entertainment within your budget. This includes getting an understanding of the time commitment for the performers, the desired activities, amenities for the performers and points of embarcation/debarcation.